At Brooks Dental, we firmly believe in the old maxim that an ounce of prevention is worth a pound of cure. By keeping your regular dental hygiene appointments, you’re helping yourself avoid the need for more extensive treatment later. 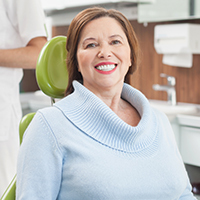 Prevention is especially important when it comes to your periodontal (gum) health, and Dr. Valerie Martins offers a range of options in gum disease treatment near Boston to help you enjoy a long lasting, healthy smile. Why Choose Brooks Dental for Periodontal Therapy? The majority of adults will experience periodontal/gum disease to some extent. It’s what develops when leftover bacteria gets the chance to accumulate in the spaces between the teeth and gums. The harmful bacteria digs in and eats away at the gum tissue, creating deeper and deeper spaces, which we call periodontal pockets. Left untreated, gum disease eventually causes loosening of teeth and/or total tooth loss. Don’t hesitate to get in touch with your preventive dentist if you notice you are dealing with any of the symptoms of gum disease. Seeking treatment right away is crucial for preventing the long-term effects of periodontal disease, like heart problems, respiratory issues, and other serious health conditions. What’s the Treatment for Gum Disease? With a few extra visits a year to our office and improved dental hygiene at home, destruction from existing gum disease can be stopped. We will work with you to achieve the best practices for maintaining healthier teeth and gums. Once gum disease progresses and the periodontal pockets have reached a certain depth, we provide nonsurgical scaling and root planing. Using special tools, your dentist or trained dental hygienist cleans above and below the gum line to remove disease-causing bacteria. Root planing smooths the root to prevent reinfection. Scaling and root planing may be completed over the course of several appointments to our office. Make sure you come in as scheduled and take any prescribed antibiotics as directed so we can fend off bacteria and help you enjoy full smile health once again. In the latest stages, surgical treatment may be necessary for treating periodontal disease. Periodontal disease can be prevented with regular hygiene visits and excellent oral hygiene routines at home. First, the basics: make sure you brush your teeth for two minutes, twice a day and floss once daily (at least). Visit your dentist every six months for a routine checkup and cleaning. When you do, we can monitor the depth of any periodontal pockets and ensure that you receive treatment as soon as possible. Maintain a balanced diet, drink plenty of water, and avoid tobacco for continued oral health. Periodontal Procedures at Brooks Dental, P.C. Dr. Martins completes all of our periodontal procedures from the comfort of our office near Boston. From dental implant placement to bone grafting and much more, we are happy to be able to provide your treatments right here, in the environment where you already feel relaxed and at-ease under Dr. Martins’ care. Dr. Martins is able to offer full-service dental implant care using the latest technology, including the cone beam CT scanner at Brooks Dental. Dental implant placement requires extreme precision to ensure the maximum success, and the cone beam CT (CBCT) gives your implant dentist the in-depth look she needs to place the dental implants precisely where they need to go. Using the in-office equipment, we can capture a composite image of your teeth, neural pathways, the strength of your jawbone, and other vital information for successful dental implant placement. Dr. Martins offers single or multiple dental implant placement at Brooks Dental, and the benefits of the comprehensive tooth replacement are significant. By stabilizing the jaw and preventing its degeneration over time, patients who have their teeth replaced with dental implants are able to eat, speak, and smile with full confidence. Healthy, well-proportioned gums contribute to lasting oral health, and visiting a highly trained and experienced dentist offering periodontal therapy like Dr. Martins is one of the best ways to protect and enhance your smile health for a lifetime. Many dentists may offer one or two periodontal procedures, but visiting a specialist is key to receiving the most expert care. Additionally, treating gum disease early is important for protecting oral health and reducing the risk of developing health conditions related to the condition, like heart trouble, respiratory issues, and others. For expert periodontal care, including dental implant placement, gum disease treatment, and more, visit Dr. Martins at Brooks Dental. Request an appointment with your periodontist near Boston today! We can’t wait to help you enjoy full smile health with superior periodontal treatments.